Before drilling a hole place the required size drill bit into the chuck and make sure it's good and tight. Take a firm hold of the drill with both hands and position it to the point you've marked. Make sure the drill is nice and level so you're not drilling at an angle which may cause the drill to slip. Gently squeeze the trigger until the hole gets started then press harder to get it to full speed. N.B. 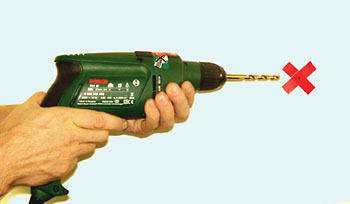 If you're drilling into brick or concrete you need a wall drill set to "hammer" action. The hammer action vibrates the drill up and down and "hammers" the bit into the wall as it spins making it much easier. To help prevent slipping simply stick some masking tape before marking your spot. This helps prevent slipping.